Blog What's So Special About Lake Ann Camp? What’s So Special About Lake Ann Camp? People are always amazed to hear where our campers come from. Over the years, we have consistently drawn campers from all over the country, and yes, all over the world. Last year we had campers from over ten different countries and from 26 different states. This year we’ve had campers come from North Carolina, New Jersey, New Mexico, Oregon and even Germany and Austria! So what’s so special about Lake Ann Camp that would have campers traveling 17 hours in a school bus? I’ve been asking that question to the church leaders and here are the top three answers that keep popping up. What do you think? Is this what makes LAC special to you? From the moment your camper arrives until the moment they leave, we fill every day with intentional programming. It’s not that we want every moment filled with activity, but we want every part of their schedule to be intentional. That means we schedule time for rest, for energy-draining play, for thought-provoking challenge, for food, and for team building exercises. Even the afternoon free time is a crucial, intentional, part of the schedule because the whole week is designed to reach one big goal: to get deep into the heart of campers so that they experience God in every part of camp, not just in our awesome chapels. The leaders that hang out all week also notice how hard we work to train our staff. Each counselor receives almost 200 hours of training before a single camper sets foot on the property. Not only are they trained in how to manage a cabin, but they get specific training on how to facilitate a group, how to work with ADD and ADHD campers, how to challenge campers to step up in leadership and how to lead a group without having to be the dominant person in the room. They learn how to discipline appropriately, how to counsel using God’s Word and they know when to escalate a situation to one of their supervisors. And it’s not just our counselors…all of our staff experience extensive training so that each camper has an opportunity to experience “life at its best” without the distraction of poorly trained staff! 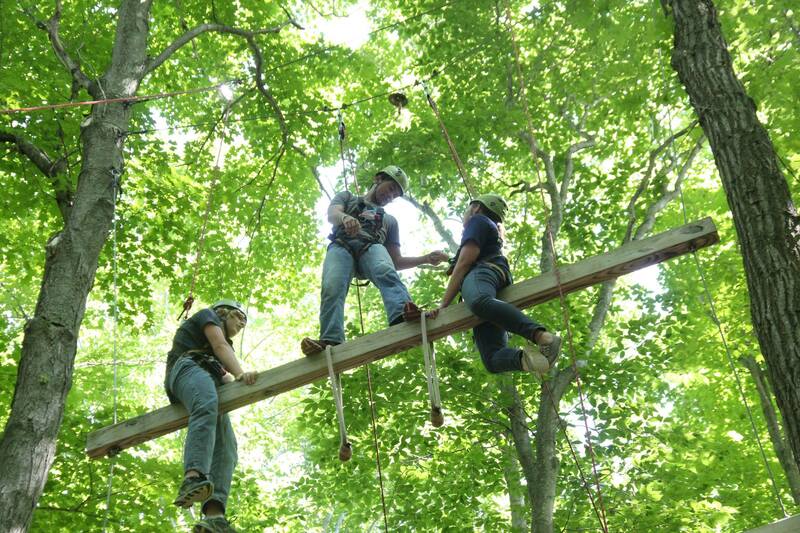 Campers are trained in rope safety, proper harnessing technique and ground-to-climber commands. The smiles are always biggest when everyone comes down safely! There have been LOTS of big smiles this summer! One youth pastor told me, “My parents worry about our students traveling more than 10 hours to get to camp. I tell them, ‘trust me, they are way safer at Lake Ann Camp then they are at 1/2 of what we do! '” I don’t think this pastor was saying he was particularly unsafe, I think he was complimenting us in how careful we are with each camper that arrives. We know that accidents are inevitable when 3,000 campers converge on our property over an eight week period. However, we train hard to make sure that those accidents don’t happen because of our carelessness or lack of training. We practice safety at the waterfront, in the kitchen, with the farm animals, while riding the Zorbs, flying down the zip line, climbing up a giant 40’ ladder or zipping down our waterside. Nothing can put a damper on the spirits of campers more than a preventable accident that leaves someone injured, so we make safety a big priority — and it shows! My conversations with youth leaders have been very insightful. These top three reasons come up repeatedly, but so do other notices they’ve made. How about you? What’s your favorite part of LAC? What makes this camp special to you? Leave some comments here, or on our Facebook page, and share your thoughts with others! To learn more about LAC and its programs, visit our website at www.lakeanncamp.com.